Mother’s Day came and my children were wonderful to me! We had a terrific BBQ out back, and with the tiki torches going to ward off the mosquitoes and music playing on the backyard Bluetooth speakers we had a terrific day! I was told by my kids that I wasn’t to do the cooking, and they did everything…but I did cheat a little. The night before I decided to make a “cake” and just have it available after dinner. 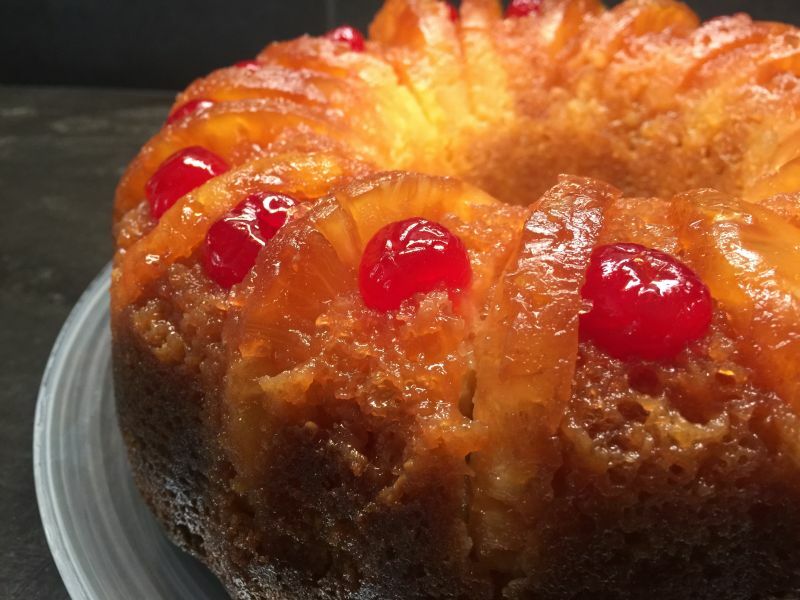 Something easy and light, so I decided on this pineapple upside down bundt cake. Do you recall how I said earlier in this blogging adventure that I like to share easy tips and shortcuts? I rarely use a box ANYTHING, but I am going to make an exception this week because this easy recipe was so good…and so fast! I took one of these cakes to work to try it out on my unsuspecting coworkers, and I was asked no less than half a dozen times for the recipe! So, I am going to share it here, while giving proper credit from whence it came. I have a Facebook account, and you know how they bring up your “memories?” Well, the day before Mother’s Day, one of the memories was this Pineapple Upside Down Bundt cake that I had made a few years earlier on Mother’s Day. The recipe actually came from Facebook. I tweaked it a tiny bit over the last couple of years, but the main idea came from there. California Girl comments: I have a whole load of recipes on Facebook that I keep saving but NEVER use. I think “Oh, that looks amazing, save it, and then it sits there unopened. When Ms. April sent me this recipe, I ran out and bought all of the ingredients and decided to try it. It just looked like wonderful summer deliciousness to me. 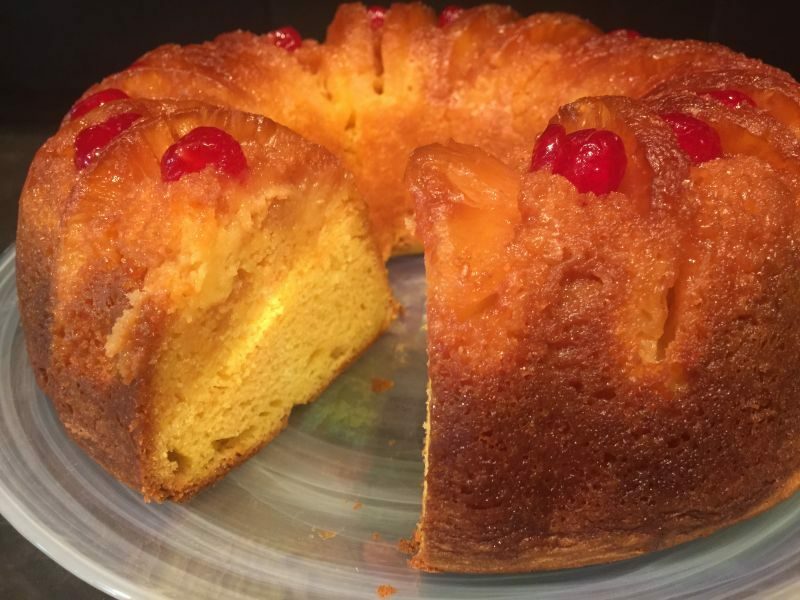 The beauty of the cake, besides the moist deliciousness of it, is the ease of which it is made–as well as the availability of the ingredients! 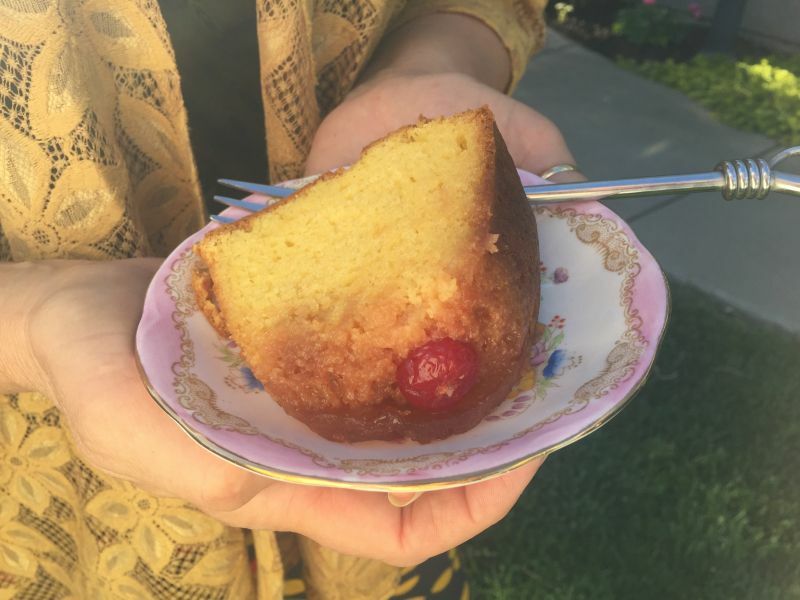 Everything in this cake was in my pantry! So here you go! 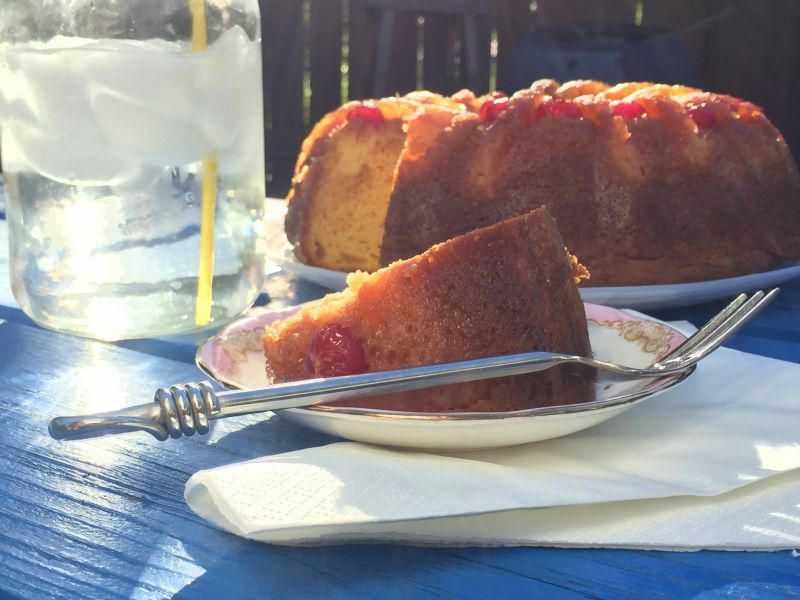 Dig out that old bundt pan that you keep in the back of the cupboard…you know the one. The one you NEVER use, but you won’t throw out because you might need it someday? Spray it generously with some non-stick spray and let’s get at it! Here’s what you will need! California Girl comments: Well, after crawling down on my knees, looking into my baking cupboard all of the way at the back I found my bundt pan. While I was down there, I decided that I needed to clean my kitchen cupboards and re-organize. I was then too tired to make my cake. Does this happen to any of you???? LOL! Preheat your oven to 350 degrees and put the rack in the middle. Melt the cube of butter in the microwave, and pour in the bottom of your prepared bundt pan. Now sprinkle in the brown sugar, making sure it is evenly distributed on the bottom of the pan. Open the pineapple rings and reserve the juice. 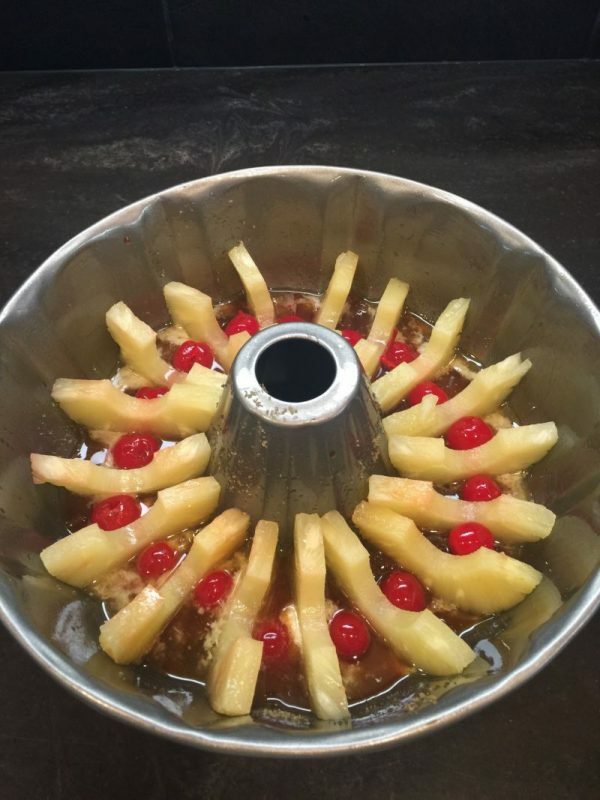 Dump out the pineapple rings and cut them down the middle so they are all cut in half. 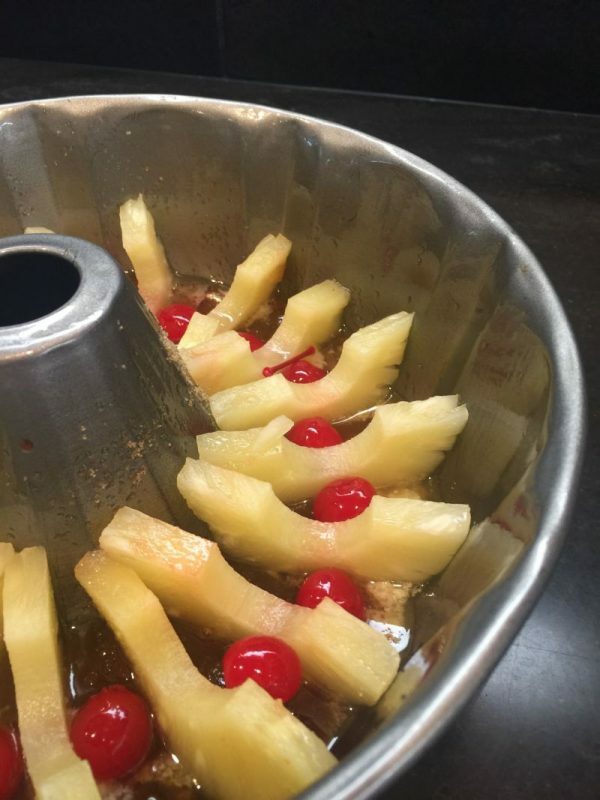 Arrange the half pineapple slices like in the picture, placing a cherry in between each piece of pineapple. The slices will nestle down into the brown sugar/butter mixture and stay upright. In a large bowl, stir together the yellow cake mix and the vanilla pudding mix. 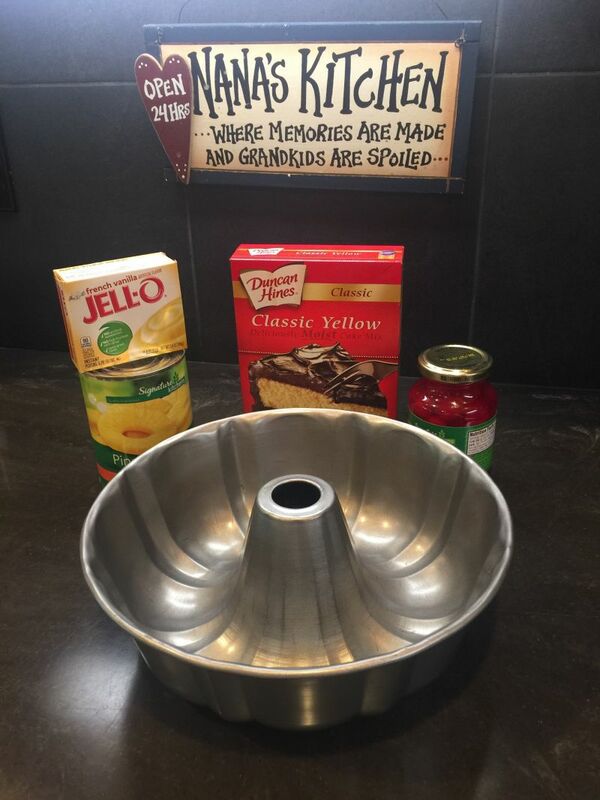 Add the 3 eggs, and the amount of oil listed on the cake box. Do not add the water that is called for on the cake mix box! Take the reserved pineapple juice and put it in a measuring cup. Add enough milk to it to make 1 cup, and then add this to your cake batter mixture, and mix well. 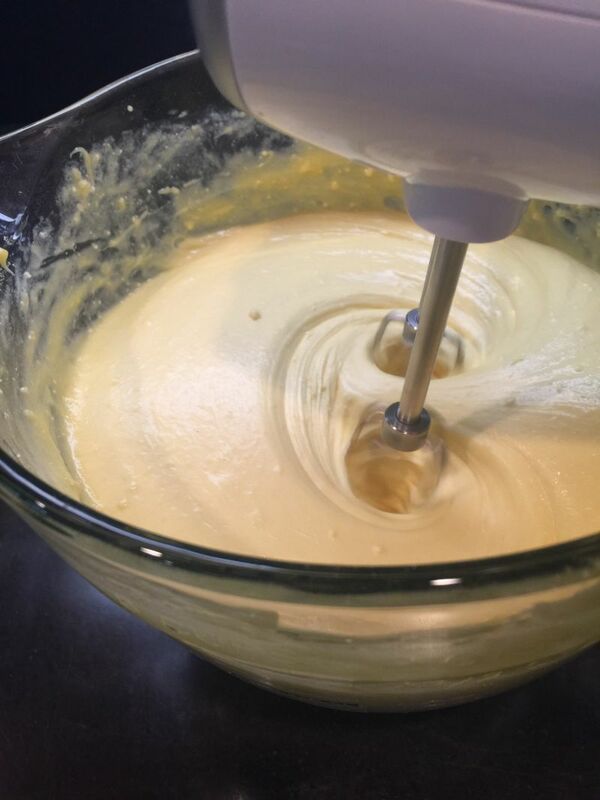 The pineapple juice will make the batter get a little fluffy as you mix, so don’t be alarmed! It will make the cake fluffy also! 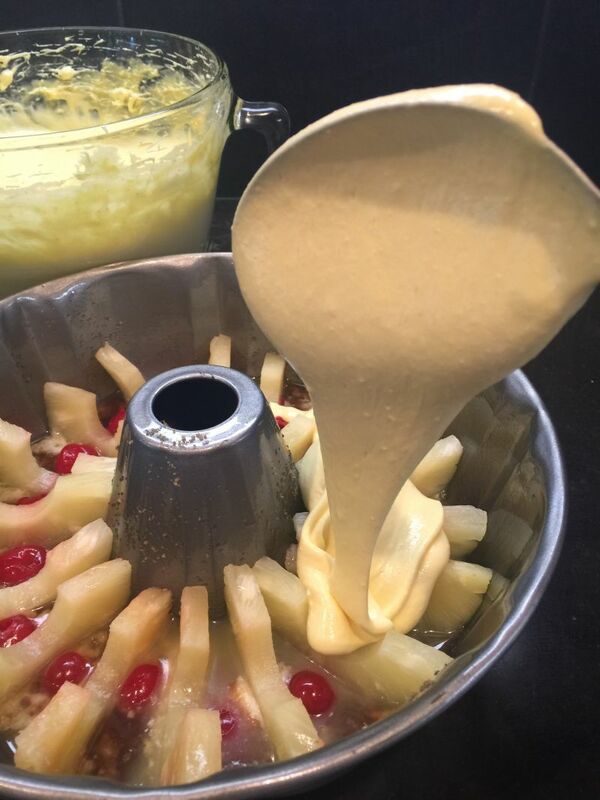 Gently spoon the cake mixture over the pineapple slices and smooth the top of the batter evenly. Bake for 40 minutes, or until a toothpick inserted comes out clean! 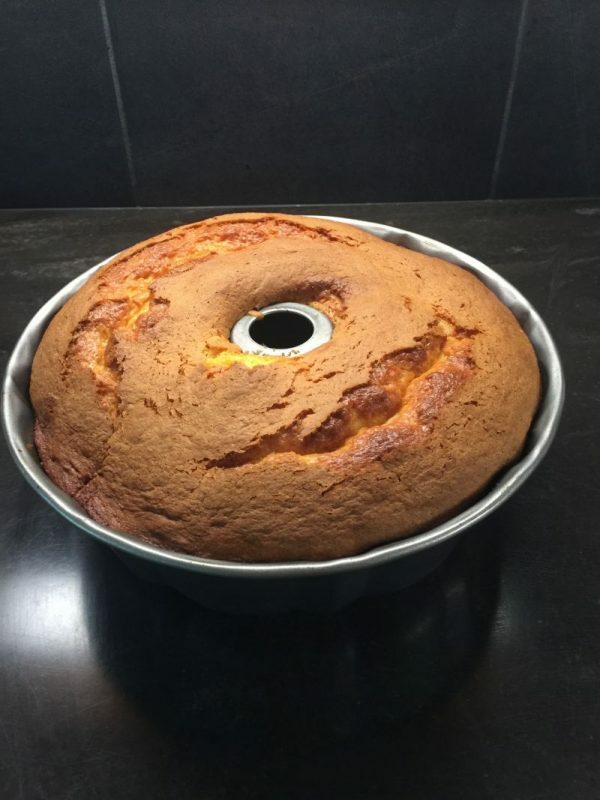 Make sure you let this cake cool completely before you invert it on a plate to serve! If you don’t, it will tear!